Ideas are a core component of your project. Whether you're starting from scratch with a new Business Idea or working on a new Product Idea, your canvas will begin to fill with Ideas, either before you get out and get Evidence to validate or invalidate your Idea, or from Evidence you've already gathered from tests or customer interviews. When adding an Idea, or clicking in to an existing Idea from your Canvas, you will see the screen below. 1. Favorite: bookmark this Idea to find later. 2. Edit Button: publish your idea to add it to your project, or make edits. 3. Three-dot Icon: delete your idea, or switch between a Business or Product Idea. 4. Help: open the Help Sidebar. 6. Details/Connections: switch between the Details and Connections views. 7. Roadmap Section: adjust which section of your Roadmap the Idea sits in. 8. Status: update the state of the idea. 9. Theme: choose the Theme that closest matches your Idea. 10. Assign: add or edit the Team Members assigned to this Idea. 11. Results: set whether the Idea has been Validated or Invalidated. 12. Idea: a brief description of your Idea. 13. Summary: add notes or further detail about this idea. 15. Attachments: attach relevant files including recordings, photos or documents. Clicking into the Connections tab will allow you to view and add connections to Evidence, Discovery Tasks and other Ideas. 16. Ideas/Evidence/Research & Experiments: filter Connections by type. 17. Ideas/Evidence/Discovery Icons: the figures next to the icons show the number of Ideas, Evidence and Discovery Tasks that are linked to this Idea. 18. 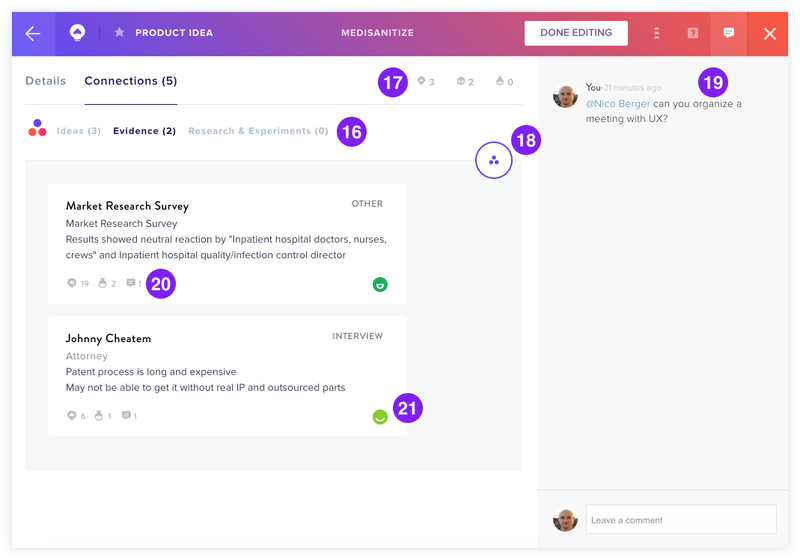 Connect Button: connect Ideas, Evidence, and Discovery Tasks. 19. 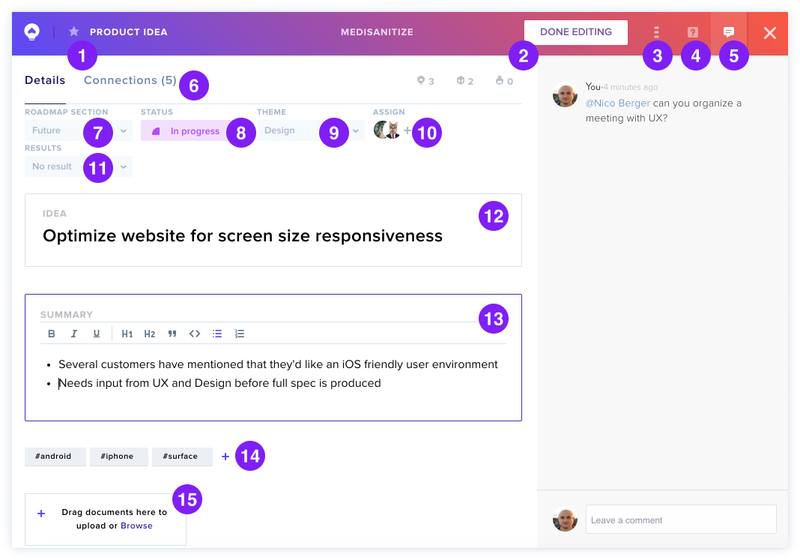 Comments: displays comments made by you and your teammates. 20. Ideas/Discovery/Comments Icons: displays the number of Ideas, Discovery tasks and Comments linked to this piece of Evidence. 21: Confirming/Disconfirming Status: indicates whether the linked Connection supports or doesn't support your Idea. Learn more about adding ideas here!